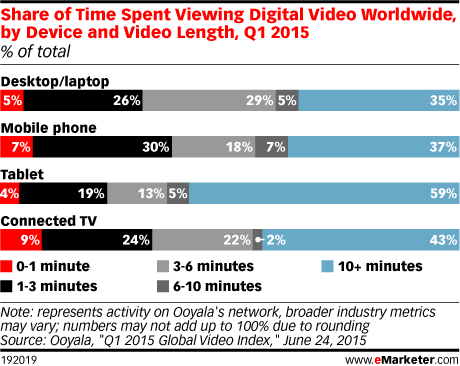 Data is from the June 2015 Ooyala report titled "Q1 2015 Global Video Index." Data was taken from an anonymous cross-section of Ooyala's customer and partner database during Q1 2015. The database includes an array of broadcasters, cable operators, consumer brand companies, digital media, print publications and studios in more than 239 countries. The data sample is not intended to represent the entire internet population or all digital video viewers. In 2014, Ooyala customers' video streams were delivered to over 220 million unique users worldwide. During the same year, Ooyala managed inventory for 30 billion video ad impressions and delivered over 11 billion ads primarily in Europe and parts of Asia-Pacific.